Well, as you can see my photography skills have not improved overnight! Please note that while this quilt looks VERY wonky, it's really not at all. I love this quilt. It reminds me of ice cream, I'm not exactly sure why, but it does ... or maybe I just want ice cream. Yeah, that could easily be it. 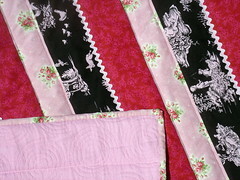 The frontside is a chocolate toile with rose colored flowers and a sweet light pink floral. 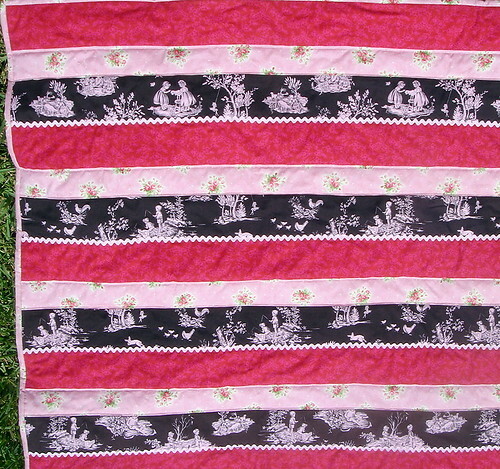 The quilt is accented with pale pink rick rack and the binding is the light pink floral. The backside IS a little wonky, but I think it turned out kind of cool. The fabric had a fade stripe where the fold was (which really really annoyed me!) 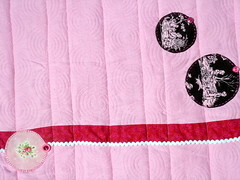 and the above is the result of trying to cover that up .. a row of the red, trimmed with white chenille rick rack, and some embroidered circles to mimic the circles in the fabric. The quilt is about 43" by 43" and is available in my shop. There are a few more photos on Flickr. No, I didn't spend the whole weekend at the sewing machine! Most of the kids and I went to Manatee Park in Fort Myers on Saturday. Manatees are attracted to the water at the park because it's fed with nice warm water from a power plant. This time of year they aren't there but in "winter" there are great opportunities to see them. Instead of manatee watching we found some trails, watched fish jump, enjoyed lots and lots of butterflies, had a show in the ampitheater (the kids, not me), and played on the playground. 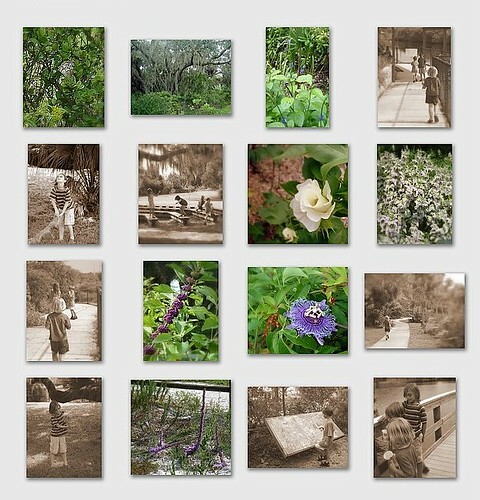 They've done a great job planting a variety of things, a great learning experience for all of us. 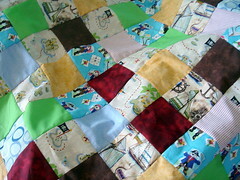 The top of a quilt for an upcoming birthday gift for an almost 3 year old pirate lover. Thanks to everyone who responded about the pirate quilt yesterday. It has found a home. I will be doing a more substantial give-away very soon!